Cinco Minas: On July 8, 2002, the Company announced an option to earn a 60% interest (and right to purchase the remaining 40%) of the Cinco Minas silver-gold property located near Guadalajara, Mexico. Historic production (Rivera and Vazquez, 1963), by agitation leaching from high grade zones, is recorded as 97,000 ozs gold and 15 million ozs of silver from 1.08 million tonnes of ore. An independent consultant, Cuellar, 1999, reported resources remaining in the old mine area of 5.07 mt @ 1.24 g/t gold and 120 g/t Ag that are amenable to open-pit mining. Underground rehabilitation is underway and the first channel sample results from El Abra and Destajos levels of the old mine area (see photos below) are very encouraging. Gran Cabrera: On October 23, 2002, the Company announced an option to earn a 60% interest (and right to purchase the remaining 40%) in the Gran Cabrera properties covering 3,950 hectares. The area covers more than fifteen significant old precious metal mines that historically produced high grade silver-gold ore. A number of the old mine areas show potential for substantial open pit type silver-gold resources and the initial work programs will focus on these areas. The Company also holds the right to acquire a 70% interest in the Las Lomas properties located between 10 km and 15 km northeast of Manhattan Minerals Corp.’s (“Manhattan”) Tambo Grande deposit in northern Peru and the rights to 100% of the Tinka property, located in southern Peru, a large copper-gold porphyry target. Tumi Resources Limited, incorporated in British Columbia, Canada, trades on the TSX Venture Exchange under symbol: “TM“. The Company directors are experienced in the resource sector and are focused on enhancing shareholder value by expanding Tumi’s assets in this sector. 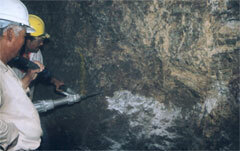 Management aims to identify exploration projects of high merit and quickly complete confirmation exploration. This will enable the Company to confirm the potential of a project and reach advanced project status by the most cost effective and shortest time possible.